Glow-in-the-dark trolley/locker pound coin token, with stylish metal keyring holder for convenience. Never again be stuck without a pound coin for the supermarket trolley or gym locker; keep a Glo Coin close at hand, attached to your keys, purse, handbag, rucksack or sports bag. The glow-in-the-dark token doesn’t just look awesome; it can also help you spot your keys in the dark. It charges in both daylight and artificial light, providing an initially bright glow, that remains visible for 12+ hours in darkness. Durable and stylish black nickel-plated finish, with robust trolley/locker token, good for years of use. Works just as a pound coin would in all types of coin-release trolleys and coin-operated lockers. The Glo Coin is an ultra-bright glow-in-the-dark trolley/locker token with metal keyring holder; a stylish and multi-functional twist on the usual pound coin tokens that are in common use in supermarkets and changing rooms. 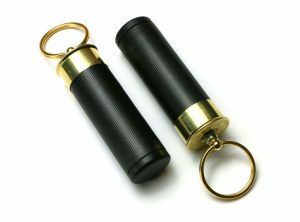 It’s such a handy addition to your keys or Every Day Carry, as it works in all types of pound coin-release trolleys and gym lockers. The token clips in and out of the holder with a spring clip, making it very quick and easy to use. 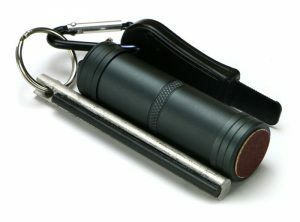 The Glo Coin holder is easy to attach to your keys or bag via the included keyring. As an additional function, the token uses the latest in photoluminescent technology, which produces a potent glow after ‘charging’ by daylight, or any flashlight/light source. 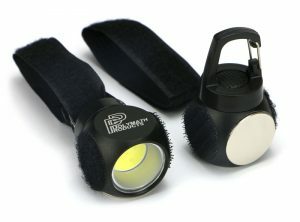 The long-lasting afterglow stays visible for 12-plus hours, which as well as looking great, also makes it easy to spot your keys/purse/bag if you lose it in the dark. The glow-in-the-dark element of the Glo Coin uses the highest grade, bright green 150μm strontium aluminate in high concentration with a binder, producing the longest possible afterglow times. The double-sided glow element charges and emits light both front and back. The Glo Coin is supplied as a single, or a value two-pack. 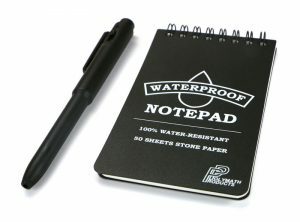 Token dimensions: 22.5mm diameter x 3.15mm thick. Weight: 3g. Keyring holder dimensions: 75mm long x 32mm wide x 6.4mm thick. Weight: 20g.